Music booming, students cheering and bleachers packed, the annual Spirit Week Dance Competition has over time become a beloved East tradition. To celebrate this year’s participant’s weeks of hard work, everyone from family members to alumni gathered at the DiBart Gym Tuesday night at 7. Although all grades put on an incredible performance, ultimately the seniors came out on top, followed closely behind by the juniors. The sophomores came in third and in last place were the freshmen. This year’s Spirit Week theme was “Through the Decades.” The freshmen accordingly chose to focus in on the 1960s. Sporting vibrant tie-dye t-shirts with their class year and tinted sunglasses iconic to the 60s, the freshmen class embodied the carefree culture true to the 60s. Songs like “Sweet Caroline” by Neil Diamond, “Welcome to the 60’s” from Hairspray, “Surfin’ USA” by the Beach Boys and “I want you back” by Jackson 5 transported the audience back in time and on their feet. Their use of a giant cardboard TV prop paired with snippets from shows like “The Brady Bunch,” “Flintstones” and “Twilight Zone” reminded parents of the days of channel surfing. Ending with a remix of “Ain’t No Mountain High Enough,” the freshmen class put on an overall entertaining performance. Shortly thereafter, the sophomores took the stage, travelling back in time to the 50s – the era of diners, poodle-skirts and record players. Kicking off their performance with a rendition of “Summer Nights,” the sophomores set the energy for the dance at an all time high. Their exciting choreography paired with songs like “Johnny Be Good,” “La Bamba” and the Barbie Theme Song helped sustain that energy. Their use of umbrellas during “Singin in the Rain” definitely added a creative touch to the dance. Next were the juniors. Coming from a second place rank last year, the juniors went into this year’s Spirit Week Dance Competition with ample experience putting together successful dances. Starting the dance off in the formation of a “9” and a “0” and cheering to the childhood classic “Are you ready kids? Aye Aye Captain,” the juniors set a nostalgic tone right from the start. Through their references to “Old Britney” in “Hit Me Baby One More Time” and the quintessential 90s girl and boy band stereotype in the Spice Girls’ song “Wannabe” and Backstreet Boys’ song “Everybody,” the juniors certainly got the audience jamming along. Between dances segments, Erica Tran (‘20) and Obinna Okorie (‘20) zoomed across the gym in rollerblades, a 90s staple for many kids. Senior Class President Kyle Krell rejoices after winning first place. The night finished off with the performance everyone had been waiting for: the senior class Spirit Week performance. The senior class in general hasn’t had the best of luck when it comes to the Spirit Week Dance Competitions. In 2015, they came in last; In 2016, they tied for third, and just last year they again came in last. This year, however, the seniors were able to pull together a phenomenal performance brimming with creativity and excitement. Their varied use of props including neon yoga mats, luminous balloons, light-up batons, a time machine and white button-downs (from Risky Business) too added to the life of the dance. The crowning moment, however, was when Vice President Dani Lazarus (‘19) ran onto the shoulders of Charlie Hess (‘19) recreating one of the most 80s-esque moments from Dirty Dancing as “Time of My Life” blasted through the gym. To end the dance, Krell, after quoting “You’re still here? It’s over. 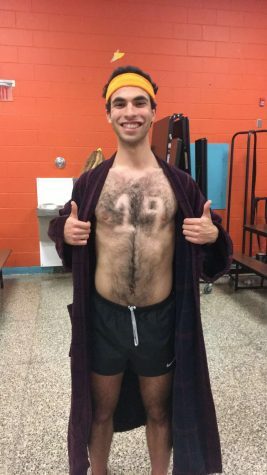 Go home” from Ferris Bueller’s Day off, proceeded to rip open his robe to reveal a “19” shaved onto his chest in honor of his class year. Unfortunately, the senior dance did go over the ten minute time limit by two minutes and as a result, the seniors suffered a two point deduction from the judges. That, however, did not impact the results. Ultimately all the dances this year were great, so much so that the seniors only beat out the juniors by one point. Now, “back to the future,” the East student body looks towards an exciting and successful rest of Spirit Week.